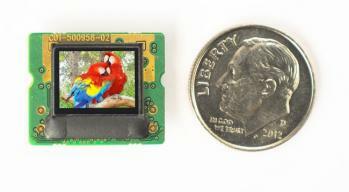 eMagin unveiled the world's brightest full-color OLED microdisplays, the color OLED-XLS series. Those displays offer 1000 nits of luminance, that is four times brighter than "current industry standard". eMagin are currently offering OLED-XLS displays in sample quantities over their entire product line (VGA, SVGA, XGA, SXGA and WUXGA). They will continue to produce the "older" OLED-XL displays. The high brightness was achieved through a combination of newer OLED materials, device architecture and processing. eMagin wouldn't reveal any more details. What we do know, is that these displays are based on white OLEDs with color filters, so these aren't the direct-emission microdisplays eMagin is developing - which will be much brighter and efficient than the OLED-XLS ones. They hope to have direct-emission prototypes by the end of 2013. Watch DisplayCentral's video below to hear eMagin's CEO Andrew Sculley discuss the new OLED-XLS displays, the XGA096 EVF microdisplay, the direct-patterning approach and other recent developments. During his video, Andrew talks about a new monochrome green panel that produces 17,000 nits (and still maintains a 50,000:1 contrast ratio). I'm not sure what kind of technology is used there, but eMagin are developing color ones too, that will achieve about 5,000 to 10,000 nits. Perhaps these are the direct-emission ones, I'm not sure.